Wonderful Shore home with Water Views built in 2014! Stunning two story entry, 9 Ft ceilings on first floor, hardwood floors and crown molding throughout! Light and bright coastal styling in neutrally decorated home with 4 bedrooms, 3 full baths plus 2 car attached garage. Enjoy Summer breezes on the rocking chair front porch or newly built rear deck. Walk or Bike to Ocean Beach. Top Notch Schools plus close to Fast Ferry to NYC. Cedar impression siding, azak trim, 2 zone heat and air, tankless hot water heater plus generator. 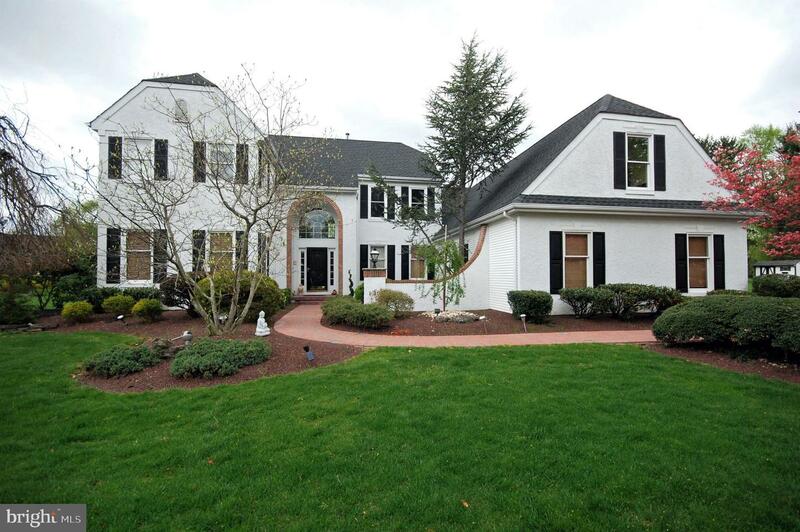 Beautiful UPDATED colonial in the sought-after Millbrook community. It features 5 beds, 3.5 baths, 1st-floor IN-LAW SUITE, study, heated pool, FINISH WALKOUT BASEMENT +3 car garage. Located on Cul-de-sac premium lot backing to woods. Entering the two-story foyer, the dining room is off to the left and living room is off to the right adjoining a study. Spacious family room with wood burning fireplace and a wet bar. Newer hardwood floors throughout 1st and 2nd floors. The gorgeous Kitchen was completely renovated in 2016. Upgrades include customized 42~ maple kitchen cabinets, Sub-Zero 48" stainless steel refrigerator, new hardwood flooring, new lighting, under cabinet lights, Bosch stainless cooktop, Bosch 30"oven, Bosch microwave/convection oven, Bosch super quiet dishwasher, over-sized quartzite stone island and countertops, warming drawer and two roll-out pantries. Spacious breakfast area with cathedral ceiling with sliding glass door to the over-sized deck overlooking the serene backyard. Updated first-floor full bath and powder room. Spacious master suite with a large sitting area and wood burning fireplace. Spa like master bath was completely remodeled in 2014, double vanities with quartz countertop, modern free-standing tub with wall feature with handheld shower, over-sized stall shower, and heated tile flooring. Three additional generous sized bedrooms and hallway full bath complete the 2nd floor. 2 Zone A/C and heating. Close to Princeton Junction train station, shopping, and restaurants. Plus award-winning West Windsor Plainsboro school district. Move-in ready and waiting for you to enjoy! Come see it today! Located minutes to downtown Princeton and Village of Lawrenceville, this estate features 5 beds, 4.5 baths, 3 natural gas fireplaces and approx 5,800 square feet of luxurious interior space. 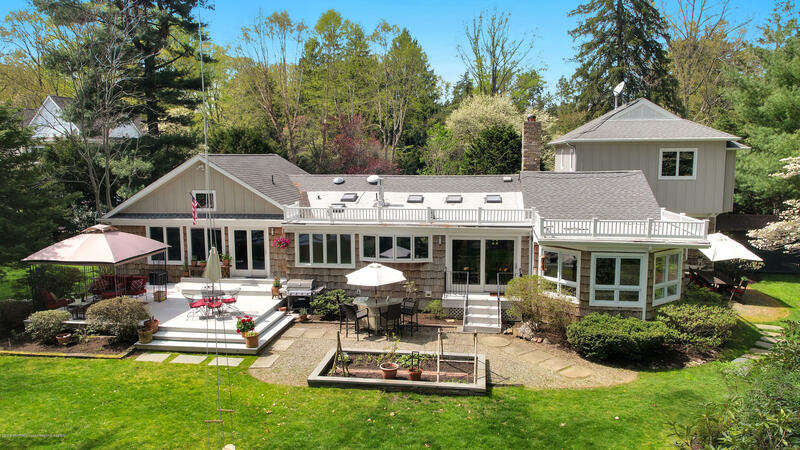 Set on 2+ acres of ~total privacy and seclusion,~ the gracious outdoor living features a Viking and Cristallo granite kitchen, a dinner-party gazebo with a vintage English slate floor, a shed studio -- all with seamless connections to the home's indoor Roman pool and vaulted solarium. The open, interior layout boasts vaulted and intimate ceilings, wet bar and tasteful renovations/additions designed to capture stunning views of the elegant indoor pool from the main house. The custom, designer kitchen features top of the line stainless appliances, a pull-up island and a sophisticated mix of cabinetry and stone. The library is quiet but dynamic with its coffered ceiling and tiger-striped bamboo floor. Special evenings can be celebrated before the exposed brick fireplace in the great room or the dining room that is upholstered with embroidered peacock-design fabric; then perhaps ending with a film in the finished basement's fully-equipped home theater. Burnished hardwoods gleam upstairs where all 5 bedrooms and 3 of the 4 bathrooms are located. Cathedral ceilings and a gas fireplace add ambiance to the master suite where a sunburst window perches over the bath~s free standing clawfoot tub; the marble master bath also features a standing shower and double sinks. The secure home is accessed through a gated entry and a long winding driveway adorned with English boxwoods on either side and majestic exotic Asian conifers. The 20 ft lighted outdoor fountain is the centerpiece of the east facing front lawn, dotted with shade, sun and secret gardens and 2 pergolas. The grounds are filled with lush landscapes including a variety of hydrangeas, hostas, magnolias, and other perennials -- perfect for every season. Experience this gorgeous home set on a professionally landscaped and lighted 3-acre property. The grand entryway with princess staircase and Juliet balcony overlooking the 2 story great room draws you into a spacious layout made for entertaining. Foyer is flanked by formal LR leading on to a cozy, delightful conservative, ideal for a good book on winter~s day & formal DR then down a hall to a bedroom & full bath. Soaring ceilings and wall to wall windows make this home light and airy. Both DR and great room lead to gorgeous kitchen featuring 42 inch crowned cabinetry, quartz counters, a four-seat island, and a window-filled eating area with seating for 8. From here sliders lead to a beautiful two-tiered paver patio & magnificent yard, naturally fenced by professionally maintained evergreens. Below, is an incredible fully finished basement w/kitchenette, media room, full bath. Second story features 2 bedrooms connected by a Jack & Jill full bath, another suite w/bath & master suite fit for royalty featuring its own entryway, sleeping quarters w/gas FP, huge WICs, separate sitting area, office area, luxurious master bath. You will never want to leave this resort-like executive home in the coveted Shadow Oaks section of historic Cranbury. 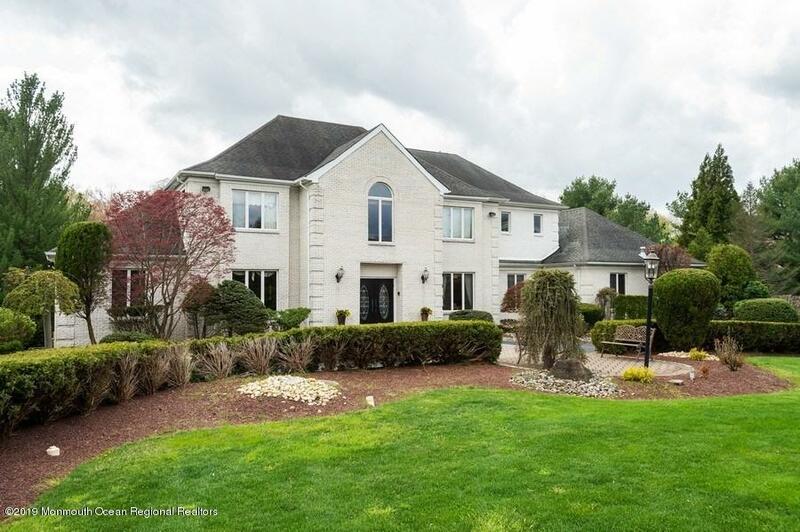 Available for the first time, this center hall colonial sits on a park-like one acre lot with mature trees and professional landscaping (including rare, oriental shrubs), and backs to the Millstone River. A truly unique space for year-round entertaining. As soon as you arrive, you will appreciate the well-designed, mature landscape. The pavers leading to the front door with leaded glass, slide lights and transom imply you are in for a treat once inside. Enter through the the wide foyer, flanked by the formal dining and living rooms. Just past the living room is a library/office with a gas fireplace with marble surround, built-in shelves and custom millwork, and leaded glass doors that lead to the Great Room. In this majestic room you will find a two-story vaulted ceiling with clerestory windows on either side, a dramatic floor to ceiling gas fireplace with stone hearth and chimney, ceiling fans, recessed lights, a wet bar with wine cooler, and refrigerator, surrounded by custom (Mouser Brand) cabinetry and pendant lights above the bar. Exquisite, serene and tranquil views abound of the park-like backyard with custom paver porch and patio that lead to custom pool with beautiful waterfalls splashing down over a natural rock display. The Great Room and the chef~s kitchen offer unlimited views of the rear yard, thanks to sliding glass doors that bring the light in. And just off the kitchen there is a door that allows access to your guests from the pool area to the full bath with shower. In the kitchen, certainly any chef would appreciate the Dacor 5-burner gas range with hood that vents to the outside, Thermador double oven, Dacor warming drawer, Custom (Mouser) Cherry cabinets with porcelain glaze and rope trim, recessed task lights and pantry with pull-out shelves. Upstairs, the Master Bedroom and bathroom offers two walk-in closets, dual sinks, custom (Mouser) cabinetry, Corian countertops, a Jacuzzi jet soaking tub (with dramatic view of the rear yard), stand-up shower and heat lamps. Convenient laundry room on second floor, too, with (plumbing available for) sink, counter and cabinets for storage. The full basement is partially finished with plenty of room left for storage, a workshop and access to utility space. Top-rated (Blue Ribbon) Cranbury Elementary School and Princeton High School. Close to Princeton Jct train, Bus station to NYC, NJ Turnpike. WHEN ONLY THE FINEST WILL DO. 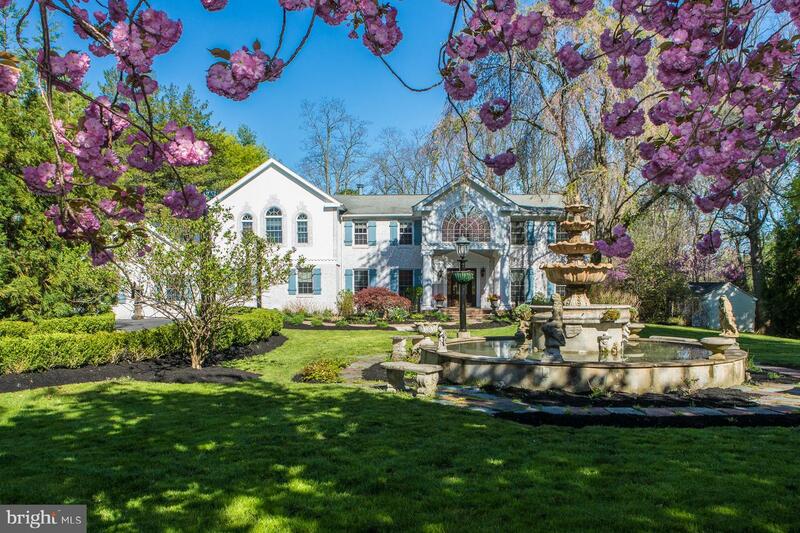 Fall in love with this Customized 6 Bedroom, 5 1/2 Bath Estate Home on 3.5 acres. Expanded w. luxurious Master Suite, Sitting Rm., Fireplace, and Granite Bath. Gracious 2-story Foyer with Circular Stairs and Balcony. Entertain in the first floor Living Rm., Banquet Dining Rm., Family Rm. and Great Rm., both w. Fireplaces. The recently remodeled Kitchen is right out of House Beautiful, boasting VIKING appliances, custom cabinetry, granite,, and separate circular Breakfast Rm. Enjoy 3 separate Wet Bars, Full finished Walkout Basement to Sylvan Lagoon Saltwater Pool, Gazebo, and Outdoor Kitchen. Relax in the huge 3-Seasons Sunroom w. wraparound decks on first AND second floors. Drive up the Belgium Block Circular Drive, and park at your front etched glass doors. Copyright 2019 BRIGHT, All Rights Reserved. Information Deemed Reliable But Not Guaranteed. The data relating to real estate for sale on this website appears in part through the BRIGHT Internet Data Exchange program, a voluntary cooperative exchange of property listing data between licensed real estate brokerage firms in which Century 21 Action Plus Realty participates, and is provided by BRIGHT through a licensing agreement. The information provided by this website is for the personal, non-commercial use of consumers and may not be used for any purpose other than to identify prospective properties consumers may be interested in purchasing.Data last updated April 26, 2019. Some properties which appear for sale on this website may no longer be available because they are under contract, have Closed or are no longer being offered for sale.